If you need an easy dinner to warm you up this weekend, this will be perfect! * you could use any type of meat but we recently bought a share of a pig from a local rancher, so we used pork and the sausage gave a great flavor. 1. Preheat oven to 375 degrees. Bring a large pot of water to a boil. 2. Cook the rice according to package directions. I found a great mix at Trader Joe's that had black barley and radish seeds. 3. Chop the top inch or two off of the bell peppers. Reserve the tops and dice up any of the flesh. Scoop out the seeds so you have a nice cup for your stuffing. When the water is boiling add the pepper cups and let them cook about 5 minutes. Drain them and set them in a baking pan. 3. Heat a teaspoon of oil (coconut or olive oil) in a large saute pan and and add the diced onions and bell peppers. Cook about 5 minutes and add the garlic. Cook another minute and add the meat. Cook until no longer pink then add the Nello's Sauce and rice. Mix thoroughly. 4. 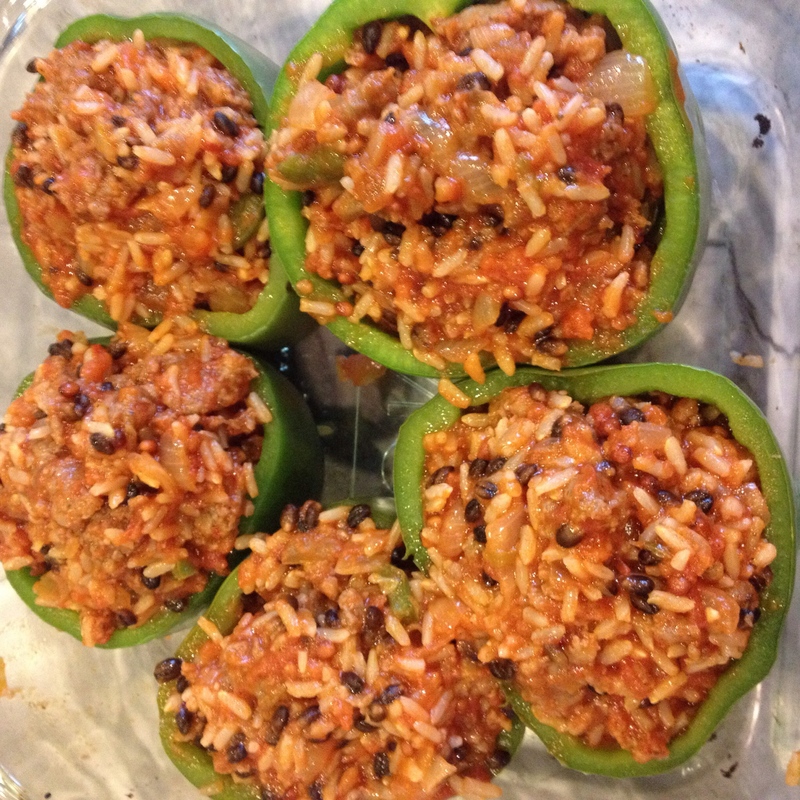 Scoop the meat/rice mixture into the pepper cups in the baking dish. Sprinkle the parmesan cheese evenly over the peppers and bake for 10 minutes or until bubbling. Enjoy! + Full Disclosure: I was not paid for this post, but I did receive Nello's Sauce in exchange for posting some recipes. You can read more about this partnership here.